Summer is here and with it comes the maturation of young herons and eagles. 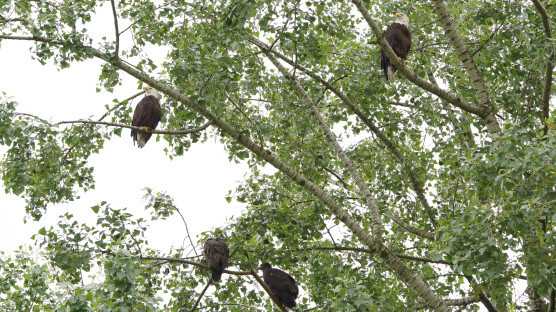 With the help of our dedicated volunteers, SPES monitors bald eagle nests throughout Vancouver in addition to monitoring the Pacific great blue heron colony on Beach Avenue. While eagles and herons are typically enemies – eagles often predate on eggs and chicks of herons – they do on occasion form a strange partnership. Researchers have found that herons have built colonies around an eagle nest. This pair of eagles will then protect the heron colony as its own territory, and though they take the occasional heron egg or chick, it is much less harmful to the heron population than having many eagle pairs feasting on the heron young. These herons take the expression “keep your friends close and enemies closer” to a whole new level. Vancouver’s bald eagles are doing really well with 18 of 20 nesting sites active, 9 of which have at least one healthy chick. The Pacific great blue herons at 2099 Beach Avenue are also doing quite well with many chicks growing rapidly in spring and into the summer. For more information on the current status of Vancouver’s bald eagles and the heron colony please see the [Download not found] and the [Download not found]. Stay tuned for more updates as the nesting season continues.